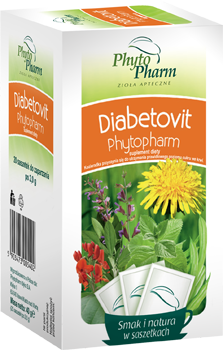 The product ingredients help to maintain the proper blood sugar level and support the proper function of the digestive tract. Fenugreek seeds, common nettle leaf, common bean pod, common dandelion root, peppermint leaf, common sage leaf. Pour 250 ml (a glass) of boiling water over 2 bags, cover, and leave for 15 min. Do not use during pregnancy and breastfeeding, and in case of hypersensitivity to any of the ingredients of the preparation. Do not take more than the Recommended Daily Intake. Do not use the preparation as a substitute for a varied diet. A varied diet and a healthy lifestyle are important for the proper function of the body. Store in a temperature below 25°C (or room temp.) and keep out of reach of small children.